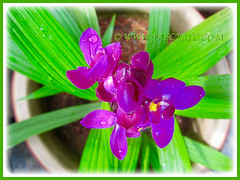 We had planted these charming Ground Orchids in pots before where they bloom all year round. Happened to come across some potted plants at a garden nursery in our neighbourhood about five months ago. However, we were somewhat disappointed as none of them had any flowering spikes to enable us to make a choice! Reminiscing about their colourful beauty that we enjoyed during our early years of marriage several decades ago, we decided to get a pot. It costs us RM18. Quite pricey as we were clueless of its flowers’ colour. Anyway, we decided to let nature takes its course. However, no regrets… none whatsoever as it recently surprised us with a flowering stalk of gorgeous pinkish-purple or magenta coloured blooms! Simply marvellous and one more flowering spike has emerged to cheer us. 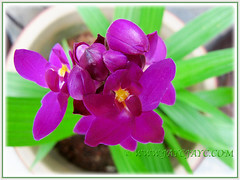 Botanical Name: Spathoglottis plicata (syn. : Spathoglottis angustifolia, S. daenikeri, Bletia angustifolia, Calanthe poilanei, Paxtonia rosea). 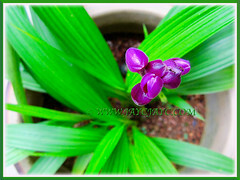 Common Name: Ground Orchid, Large Purple Orchid, Pleated Leaf Spathoglottis, Common Spathoglottis, Philippine Ground Orchid. Etymology:The genus name, Spathoglottis in Latin, meaning sheathed tongue, refers to its spathulate shaped lip. The species epithet plicata, in Latin plicatus, meaning folded or plicate, refers to the plant’s pleated leaves. Origin: Native to tropical and subtropical Asia, including Malaysia, Singapore, Philippines, throughout Indonesia to Australia and the Pacific Islands. 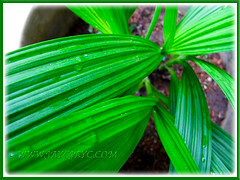 Plant type: A tropical evergreen and perennial herb. 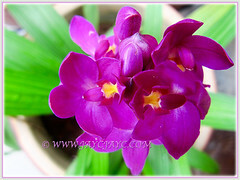 Features: Spathoglottis plicata is a showy species of the genus, Spathoglottis. Unlike most orchids, the Ground Orchid or Common Spathoglottis is a terrestrial species that is neither aquatic nor epiphytic. An evergreen perennial with a clumping habit and moderate growth rate, it can reach between 30-45 cm in height. The lovely bright green leaves that emerge from the pseudobulbs are beautifully pleated lengthwise and lanceolate in shape. It produces an erect flowering spike (up to about 70 cm high) with a cluster of terminal flowers that open gradually in succession over a prolonged period of time that last about 2-3 months. 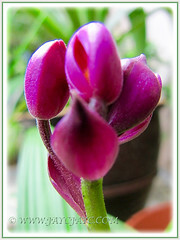 Each flower has 2 petals and 3 petal-like sepals and a spade-like labellum. Flowers are showy and come in many varied colours, namely purple the most common, magenta, pink, violet, white rarely and multi-coloured (in hues of golden brandy, yellow and orange, or pink and off-white). The showy blooms contrast marvellously with the bright green foliage. Flowers are self-pollinated, probably by ants. These flowers are followed by dehiscent, six-ribbed seed capsules in green that burst open when mature to brown to release the tiny, dust-like seeds that are mainly wind-dispersed. 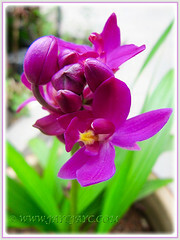 Culture (Care): Spathoglottis plicata grows easily with the least maintenance and is a hardy tropical perennial. Light: Full sun to light shade and high humidity for optimal growth and flowering. Preferably, no direct sunlight which tends to scorch the leaves. Moisture: Moderate water requirement. Allow the soil to dry out slightly between waterings. Soil: Grow in organic-enriched, free draining and loamy soils. Others: Do prune off withered yellow/brown leaves and spent flowering spikes to maintain tidiness and be aesthetically pleasing. Feed once fortnightly and lightly with a balanced organic orchid fertiliser, one that provides healthy growth and flower production. Generally free from serious garden pests and diseases. For subtropical and temperate regions: Hardiness: USDA Zone 11 (above 4.5 °C). Tender perennials that will die back below 4.5 °C. if ground-planted. Best to grow them in a pot and over-winter indoors or in a greenhouse. If grown indoors, provide sufficient warmth, high light and humidity. Under ideal growing conditions, it’ll bloom in spring, summer and autumn. Propagation: By seed or division of the pseudobulbs. 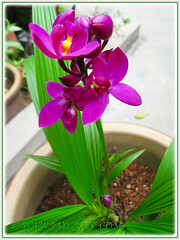 Usage: Spathoglottis plicata or Ground Orchid is an impressive ornamental plant that’s suitable in a sunny flower bed. Excellent in the front of a perennial garden border. 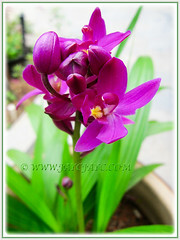 Ideal in container planting for easy relocation if required according to sunlight needs. Would be fabulous too if grown in an above-ground planter with various colourful hybrids of these Ground Orchid to increase interest. Tibouchina mutabilis, an enchanting bush with a riot of colours!